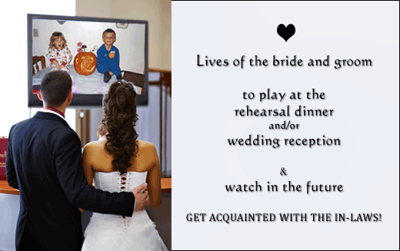 Your wedding guests will be entertained with a fascinating, custom video of the story of the lives of the bride and groom growing up and meeting. Created with YOUR PHOTOS and YOUR FAVORITE songs. A treasured family keepsake, to watch again in the future (especially on anniversaries)! Watch some of our professional slideshow montages, and you won't want to settle for the do-it-yourself kind! - Ready in 1 -2 weeks, after you preview it and get any desired revisions. HOW LONG? HOW MANY PHOTOS? At about 10 photos per minute, that would be 50-150 photos. Bring prints to me in person, organized in their order of appearance in the video. For digital photos, you can email them to carole@creativephotoslideshows.com, or bring them to me on a flash drive when you come here with your prints. if you don't live nearby, please DON'T SNAILMAIL your photos. Get them scanned where you live. Now you'll have them as digital files to email to me. WHY OUR SPECIALTY IS YOUR BONUS! 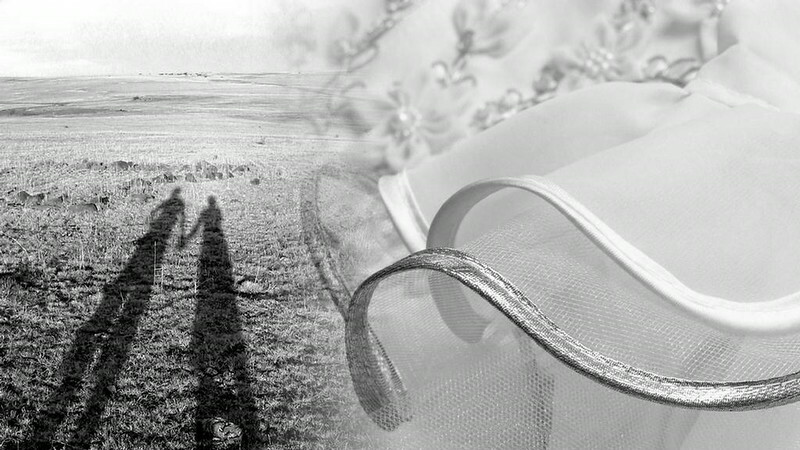 Unlike wedding photographers who "take" photos, our specialty is "working with" YOUR photos. Unlike your friends who might make a show for you, we are Photoshop experts and fix up your photos to look their best. Unlike retail stores, we offer a completely customized show, not a template. And all motion, transitions, color-coordinated backgrounds, and other special effects are always included in the per-photo price. Unlike retail stores, we select the effects to enhance each individual photo. The photos are visible for as long as it takes for the viewer to appreciate the content. There's no set number of seconds per photo. However, unless you have photos with large groups of people, the average photo count is 7-10 photos per minute.